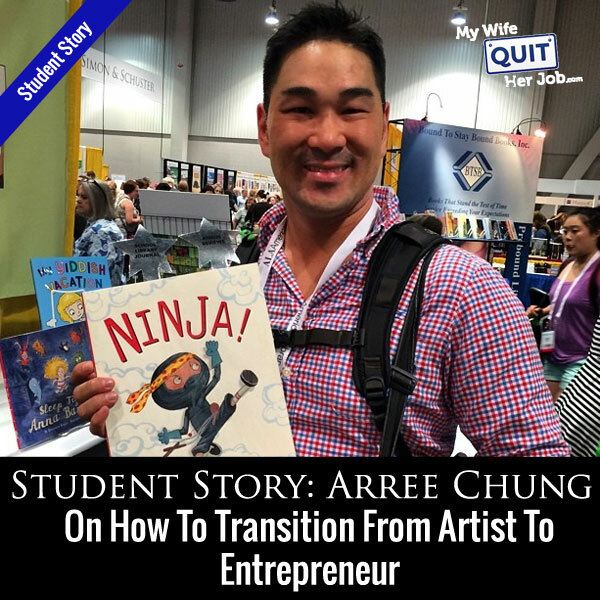 Arree Chung is one of the students in my Create A Profitable Online Store Course. And what I like about Arree is that he’s a professional artist who writes and illustrates his own children’s picture books. Now most artists try to make money by selling prints and copies of their work but Arree realized early on that that path would not generate enough income to make a living. So Arree and a group of his friends got together and decided to launch Live In A Story, a site that sells high quality children’s wall decals designed by artists. Today his shop is doing really well so I invited him on the podcast today to talk about his experiences in starting his online store. Enjoy! You can literally start your online store in a matter of hours. Simply go to www.bigcommerce.com/mywifequitherjob, sign up and you’ll instantly receive one month free. Once again the URL is www.bigcommerce.com/mywifequitherjob, now on to the show. Steve: Welcome to the My Wife Quit her Job podcast. Today I’m really happy to have Arree Chung on the show and Arree is actually a student in my Create a Profitable Online store course, and it’s actually been a while since I’ve had a student on my podcast, but recently I got some emails from people wanting to hear about more students, because they want to hear about people who are actively in the trenches. People at the very beginning instead of already established players. Now Arree is kind of unique and that he’s an artist in the purest sense, and prior to starting his online store, he was actually a full-time illustrator. And as you know, making it as an artist can be kind of tough. A lot of artists try to sell their own prints online, or they try to sell their own drawings, and there is a reason why they have the term starving artist. Now instead of giving up on his art and pursuing a completely orthogonal profession just to make money, Arree has kind of managed to merge his artistic passions in with his business, he is the founder of liveinastory.com, which sells high quality decors with his own illustrated art. Now, but these decors are not just limited to Arree’s illustrations, he’s actually signed on many artists to create custom decors and his shop is just starting to take off. He’s now doing four figures per month, and he is just at the tip of the ice-berg. And so, with that intro, welcome to the show Arree, how’re you doing today man? Arree: I’m great, thanks for inviting me Steve. Steve: Yeah, really happy to have you. And I thought if you could just take a couple of moments and tell the audience about how you kind of came up with the idea with liveinastory.com. Arree: Yeah sure. So I have a lot of friends who are having babies and actually I used to promise my friends that I would paint them a mural in their kids’ room. My best friend who had his son Jade about– I’m going to say about seven years ago, I promised him that I would paint his kid’s room and then– I was in arts school at the time, and just months and months passed on because everyone is busy, and it’s actually a ton of work to do so. But I made good on it, and I drove to his place in Sacramento and bought all these paints and just worked like a dog for like two days and– but I created this really beautiful environment and I was really happy to contribute and make something for him. And– but I definitely thought to myself like that’s not scalable and I would probably only do that for one of my best friends. Even then I just don’t have the time to do it. Arree: Yeah, if you have another baby then, [inaudible] [0:05:04] but how I came up with the idea latter on was, I actually wanted to be a picture book artist for the longest time, and I finally had the opportunity to do so. And one of my friends Brian Won also came out with a picture book called “Hooray for Hat,” and somebody wrote on his– wrote article about his book, and just praised the illustrations that they were so delightful there. They could work as home decors, that you could just buy the book and literally buy two copies and cut out one of the pages of one book and make wall decors or prints off of them, and that’s when the magical idea came to me that instead of painting people’s walls that you can leverage the beautiful art in children’s books to make wall decors. And then I started researching wall decors and I just saw the art work in wall decors is not of anybody, but the wall décor art out there is terrible. I mean it’s made by people who haven’t really dedicated their lives to making beautiful illustrations for kids, and just doesn’t have a sense– the same kind of soul or story behind it, and so I got really excited about that. And that’s when I just knew I had to do this business. Steve: So one thing I love about you is that you are so passionate about your business. Now, we’ve actually had the opportunity to have lunch and chat, and I can just feel the passion that’s exuding from your pores, and one thing I like actually, and we had this conversation over lunch one day, we were just talking about artists and how they can make money, and how they sell art in the first place. So one thing we did talk about is, why didn’t you decide to sell prints and how did you kind of merge your inner entrepreneur and your inner artist? Arree: Yeah. So I think I’ve always been an artist at heart, and just give me a little bit of background and then I’ll go forward is, I actually graduated at Davis with Economics degree and I worked in business world, and while I was working in the business world, I always want to draw and to make stories. And then I took a leap of faith and quit that consultant job for a job at Pixar and from Pixar, I quit to go to art school and then just basically through logic, and reason behind and just pursue my passion, and I think that’s what a lot of artists do is that they pursue what just feels right in their gut. But then when it comes to making a living, I think it’s difficult, there’s just no way around saying that it’s difficult because you have to create your vision and you have to create a service or a product. So out of art school I started working through video games and I made a lot of games I just wasn’t into or passionate about, but they were good paying jobs and I learnt a lot. And so I started thinking of two things, one what kind of art that I want to create in the world which was picture books, which happens to be a product that is a business. So I started pursuing that, but that’s also a very difficult endeavor to do, and then I started thinking about what is it that I would want to make in the world, and whenever I like walked into a twist store or a book store, and I go to book stores all the time, I just see a lot of really neat things and I just want to make something that would live there as well. Like I always felt like, I can make something that could be here. And I just didn’t know necessarily how to get there. So I think the merging between entrepreneur and artist has always been with me, and as I’m getting older and more experienced in– through work experiences I’ve been able to merge [ph] the two. So going to your original question of why not sell art prints is I think a lot of artists think that they can sell art prints online, and some do actually do quite well, I don’t want to say that you can’t do it at all. You have to have a built in audience that you are selling to, and you also have to think about what– you have to view your art work and I know this might sound unpopular, but you have to view your artwork as a product. What is it that people want to buy, and how do you differentiate yourself. I think your class has been great because we do start from the finding a niche on Google, and using the key word planner just worked tremendous, I mean pure simple businesses meeting demand, and I think that there’s lots of businesses that support selling prints online, and they are in the business of distributing prints, they are not in the business of building your brand and building your art work. So I think that a lot of artists end up wanting to sell hundreds of prints, but they don’t put the time into marketing their prints, finding distribution of their prints. They don’t think of all of the business parts of running a business to actually move products. Steve: So in that respect– I can’t even remember the last time I actually bought a print. But in order to sell something as an artist it almost feels like you need to have a large built in audience that really cares about your work and that sort of thing. And so when you chose decors it kind of made the product a little bit more broad, right? These are families who are just having children. They want to decorate their child’s room, and in the meantime they are reading all these children’s books, so it would be kind of cool to have those characters on their walls. [It’s alright] [ph]. And so that was kind of how you got the idea. Arree: Definitely, absolutely and I think that wall decors is a good application of art to a product need where instead of painting the wall and sort of hiring someone, they can conveniently buy a product that they can decorate the room in ten minutes, 15 minutes. Steve: I thought I’d just share this with the listeners out there. Arree just recently licensed all the goodnight moon artwork for his decors as well which I thought that was pretty cool. Arree: Yeah we are working on that product right now and we are working on how we are going to launch it, but it’s really exciting. I think it’s going to raise awareness for our company as well as add a classic to all these contemporary artists that we’ve signed on. Steve: So let’s talk about– let’s go back in the beginning when you first got started now. And you know you are still in the trenches, but what were some of the most difficult parts for you about getting started? And so I think the hardest part in the beginning was actually just figuring out how to make a great quality wall décor, how to produce it efficiently. Steve: Okay, and let’s talk about some of the research aspects. I mean wall décor spends a whole bunch of different things. How did you kind of settle on the main designs that you wanted to target? Steve: Yeah unfortunately it went down. Arree: Yeah I think too many people were researching a lot out of it. But it was a really great researching tool where you can find stores that are selling specific items, and you can look up what their average selling price is and what not. But actually I found that a little bit later. You know I’m a pretty numbers-metric-driven guy. And so we actually found a few stores that we thought, that we saw that they were doing quite well. And we actually went through Etsy and downloaded their sales data. You know it’s public domain. If you go Etsy store you can just look through it. And by doing– I think we downloaded ten stores or so sales data for a year, and just went through and systematically looked at what people buy and we just categorized them. And that gave us a good idea of what kind of product next to offer which is actually like you know like now six months later. It’s holding true that we discovered people pretty much for the most part want to buy trees, tree wall decors. From there we did analytics keywords search and also saw demand was there, and that’s when I knew that there was an opportunity. And your class really gave me the confidence that I could pull it off. Steve: So one question I did have to ask you was, why did you decide to do your own website as opposed to just relying on Etsy for example as your main platform. Arree: Yeah so Etsy– there is a couple of different reasons. One is Etsy is their own platform and you don’t have to rely on them, so being reliant on them if they change any of their rules or what not, your business can be wiped out right away. There are also a ton of competition on Etsy, and by running our own website we could utilize Google adwords and drive traffic that way as well as do social media and a lot more long term things. And probably maybe the biggest reason after that is that we want to establish a brand that is going to make just beautiful products out of children’s book art work. And that’s something that will be you know bigger than just an Etsy store. Steve: So here is the thing. If all of you guys are listening, can you just go and check out his site. It’s at www.liveinastory.com it’s actually a very beautiful website and the art work is incredible. So one thing that I get often, a question that I get asked is, some people especially artists, they are a little squeamish because they might not be tech-savvy at all, so how did you actually create your website and what platform did you kind of settle on. Arree: So I partnered up– I think in the beginning of starting a company it’s really good to think about what your strengths are and what your weaknesses are, and certainly there are a lot of things that you just don’t have experience on that you are going to have to learn. So when I started the company, I found co-founders that balance each other really well. And so my friend Catalina, she, and I worked out a previous start up together. She’s tech-savvy, and so she ended up taking on the website and I knew that between her and I that we could build the website together. I believe that she is using Blue Host as the shopping cart. And then I think we have a template that she basically is building off of. Steve: Okay, so you guys are just using open source? Steve: Okay cool. Had it been you by yourself, you probably would have chosen a different route. Arree: Yeah if it was me by myself I would just do Shopify, because I know that they have a great deal. I think the templates look really nice, but I think that– I have experience using the Squarespace for my own personal website that I did by myself for most part. And I think there are positives and negatives to using those services. Now the positive of using the templates is you are pretty much good to go, it’s pretty first and easy, but adjusting anything is a real hustle. You really have to– even for developers, adjusting a template can be kind of scary. So sometimes it’s easier just to build something custom. And I think like long-term optimizing your own website is probably a lot easier than building a website if that is if you have the technical capacity in house. Steve: So in terms of getting started for you, you had to figure how to produce your products. You got the website covered with your partner. What were some of the other things that you had to do that were kind of difficult when you first got started? Arree: Yeah, there’s a bunch of little nitty-gritty things. So finding the right printer and the right cutter and the production sort of the production requirements; initially we really wanted to bootstrap completely on a very small budget. So we were actually planning on running out of our garage during the garage start up. It turns out that the power requirements for our large printer just wouldn’t work in a garage, and we would need a lot more space. So we ended up to having to an office and finding an office that would fit our budget and what not is also a big task. So you know that probably took us a month. But those were some of those initial huddles. Steve: And then– actually I’m just curious how much did you spend just to start this business? Arree: Okay so the monthly– I want to say probably less than $2,000 initially to start. Yeah it’s not too bad. So our equipments we’re leasing. It’s pretty much lease to own. So the monthly is actually quite affordable. But when you add rent and what not then you do have at least a few thousand dollars of expenses every month. But you know, overall that’s still a pretty low burn rate for a company. Steve: So can we talk about your decision to actually print these yourself as opposed to just using a third party in the beginning. I mean sure the quality might not be nearly as good, but at least you can get up and running without that initial cost. Arree: And for us to get the cost way down, we’ve had to really work on how to optimize the printing and how to use the least amount of paper. So there’s all this work that actually goes into making the product an affordable product. And if we are going to go with a third party, we’d still have to turn around those files and actually work with them hands-on, and just be really back and forth on it. And then they would definitely charge big time. And then the material itself in the mark up that they would charge too still would pretty much eat away all your profits. It just wasn’t actually a business opportunity there. Steve: One thing I like about just you and your business is that you have a long term vision for your profitability. So I’m just curious, in order to generate some quick profits, did you ever at any time think of just getting some of these decors from like Asia or what not, and just selling them so that you can make some money, bootstrap your business and eventually sell your own stuff? Like what was the thought process in terms of short term money versus the long term? Arree: When I was initially researching the niche of wall decors, I got super excited because you could buy these decors from overseas for a dollar or less. And there are people on the internet that are selling them for $70 and they are producing– they are buying it at volume for $5 or less; sometimes a $1 or less. But that wasn’t consistent to what our brand was and who we were and that wasn’t something that I wouldn’t be proud of sticking my name on it. So we never entertained that thought at all and I just put it as a challenge to ourselves that we would need to value the long-term vision, and need to be able to produce a design that people are willing to pay money for to become profitable. And what I’m really proud about in the– you know I think we’ve really had about four months of sales in terms of having our website up and doing very little bit of marketing. We have lots of satisfied customers and we are getting some word of mouth referrals. So I feel like we are building a brand right from day one and people are talking about us in a positive way, which is something that I don’t think that could have happened if we just bought products from overseas and try to sell it. Steve: Yeah there’s a lot of generic products out there. I know firsthand from seeing your product that is top notch quality and the printing is on a different level as well. So let’s talk about sales a little bit. So how did you actually get your first sale? Arree: You know it’s– we got our first sale– I want to share with you actually some maybe embarrassing story. Initially when we started the website we were just trying to throw a lot of traffic at it through adwords. And a lot meaning like 50 people a day, it’s not a lot. And for the first week or two, we actually didn’t have any sales. But later on we actually discovered that there was an error in the shopping cart. Steve: How did the librarians start hearing about you? Arree: So we started a Twitter account and we also started a Facebook account, and we started a blog. I did a blog post on our vision and how and what we wanted to do. And there’s just a really great community on twitter of librarians that started sharing that blog post and people started talking about it on Facebook. And so we got a lot of traction just off the bat with the book community. So the children’s book community is just a really amazing, supportive, encouraging, community that really values kids and books and creativity. They are so encouraging and whenever they see something that they are excited about, they talk about it. So we haven’t done a ton of marketing yet and that’s actually what we are going to work on next. But our initial sales have actually come through just people talking about us online. Steve: That’s amazing. So these librarians, do they buy it for the library or are they buying them for themselves? Arree: They buy it for the libraries. Steve: So that market is probably pretty small I would imagine. Arree: I actually ran the numbers on how many librarians there are in the United States. So it’s very niche. I think there is 125,000 libraries in the United States. And so it certainly isn’t– it’s middle skill compared to how many parents there are of course. But I think that is a market that’s underserved, and that’s just really, really low. Steve: So you started with librarians and then what is your plan going forward? I know a lot– so let’s talk about what you’ve been working on. Because I know a lot of what you’ve been working on is kind of some of the infrastructure for your store, and poising for growth later on, that’s why I mentioned you were kind of on the plasp [ph]. So what have you– what are some of the things you’ve been working on in terms of products? Arree: Yeah, so in terms of products I think there’s two main elements that we’re working on, there’s– the first thing is having really amazing artwork and a vision for the product lines. So we’ve been working on the perfect – so called perfect catalogue that we would want to offer parents and librarians. And then going through and contacting those artists and seeing if they’d be interested in working with us and to my delight, there’s so many great artists that we’re bringing on fairly shortly. So Molly Idle, she does this book called “Flora and the Flamingo.” It won the Caldecott Honor award, a year or two ago. We have artwork with Greg Pizzoli, and he won the Dr. Seuss award a couple of years ago for his book “The Watermelon Seed,” and he’s making really amazing artwork. You know, all these people make really amazing artwork every year. Steve: So what is your value prop? Like how do you convince them to come on? Arree: Oh, it’s actually a pretty simple value prop. The value prop is that– the first part of it is you know just making beautiful artwork out of your décor, out of your artwork. It’s just a fun thing that most artists are interested in. But I think the longer term value prop is that; artists especially picture book artists are building their own brands with every single book that they do. And it’s just a natural extension of their characters in the stories, and there’s lots of librarians and parents that love your work already, and you’re just giving them another opportunity to extend that story and to support your artwork. Steve: So these artists, do they already have a built in audience in email list that they can tap into to sell these decors? Steve: Are you allowed to comment on what the revenue break is? Like when someone buys a decor from you that was designed by somebody else? Arree: Oh, sure, yeah. Absolutely, so I’m a big fan of being honest and transparent, and I think it’s helpful. So in typical product licensing, a royalty will run you anywhere between 4% to say 20%. So for example if I made a bunch of flower designs and I tried to license that to a company that makes bedding, since I’m probably not very reputable, they’ll probably just give me about 4% of — 4% royalty. And then if you say try to license, I don’t know, marvel characters from Disney, which is a huge property, they can take upwards of 20, 25%. Arree: And at that point, then they’re eating up a lot of the profits. So we do a pretty standard royalty which is– you know I believe in giving a very healthy royalty, because I only want to work with the best talent. And so we’re paying a royalty of 12% to all the artists, and it’s extremely healthy royalty, and so from a product stand point, you know if we’re selling something for $100, $12 goes to the artist, so it’s a really great revenue. Steve: Yeah, so you’re kind of like a Zazzle in a way, so to speak, right? Steve: No, absolutely, absolutely. No I mean I love your model, because you’re an artist, but there’s no way you could put out the volume of designs and just by licensing artists that are kind of within your own network and within your very small niche, you’re able to get a whole bunch of designs. And it’s kind of a win-win, right? For these artists, they don’t have to do any work once the licensing takes place, right? Arree: Yeah, they don’t have to do a lot of– I mean, they do have to help build their collections and design their own collections, and I give them feedback. So there is a little bit of work involved there, and sometimes they make some new artwork. But overall, they don’t have to worry about manufacturing, they don’t have to worry about [inaudible: 00:30:05] they don’t have to worry about all that other stuff. And to that point, I think you know, where Zazzle – the difference between we and what Zazzle does, is Zazzle is just selling a tone of mugs and T-shirts, and they don’t work with anybody specifically. Like we’re actually spending time to market each one of our artists specifically to you know, it raises brand awareness to parents. You know we’re marketing, we’re telling them about the picture books that our artists make and what not, so yeah, it’s great. Steve: So how do you actually convince one of these big names? It’s you mentioned that you signed on Goodnight Moon, which is pretty huge, how do you convince them to take a chance on one of the smaller guys? Arree: So the story behind that is; I go to New York for my own picture book career and I meet with editors and what not, and last time I went I actually brought a lot of product with me, and I just started giving the product away. And I think like the way you convince most people about taking a chance with you is actually just having a very compelling vision about what you want to do. And so I just shared with them the vision of bringing really great artwork to walls. To the walls of kids homes and libraries, and I showed them what the current market is. And so the current market right now is; there are big players that basically license Disney artwork, and big movie artwork, and you know things like Frozen and what not. And then there are a bunch of small players that offer very generic artwork, and there’s nothing in-between, and that’s where I saw opportunities to build this direct connection between artist’s work and leveraging the internet and online stores, and also building distribution through retail to fill that middle part where you’re actually offering very unique, charming artwork. Arree: Yeah, and I think it was through an editor, either through an editor or an agent. Steve: Like I said, when I– the couple of times I’ve chatted with you, you’re just so passionate about your idea that it really comes across, and so that’s probably what they cued in on, and that’s why they wanted to work with you. Arree: Yeah, you know, it’s up to me to make it happen, now. Steve: So real quick, so you know there’s a lot of artists out there who are listening to this, and let’s say they’re photographers or they’re artists, what sort of advice would you give them if they want to start their own business that kind of involves their passion? Arree: I think the best advice I can give anybody in terms of starting a business or even starting a creative endeavor, is actually the same thing. It’s just to get started and not to be afraid. You’re going to make lots of mistakes early on, and I’m a firm believer in just the power of will and grit, and hard work, and not being afraid of failure, and actually reaching out to people, and figuring things out along the way. So I’ve learned a lot about life, and just becoming an artist. Like you know I started really becoming an artist when I was 25, you know I’m 37 now and you know that 10,000 hour rule that people talk about, where it takes 10,000 hours or roughly ten years to be great at anything, is a 100% true, and I’ve seen it in my life, and I think if you’re starting a business, or you’re starting anything, it just takes a lot of time and dedication to get really good at it. Steve: Let me ask you a question in a different way. Would you advice that these people do something, or pursue a business related to their passion, or something orthogonal? Steve: So what would you advice, so let’s have a photographer, what are some of the ways I could research different ways to make money with the business. Like where did you go to? You mentioned earlier you did Etsy and you looked on Amazon. Are there any other places that you looked at? Arree: No pretty much just Amazon, Etsy, and Adwords. I think that the internet– leveraging technology is really important, because everything is quantifiable now. So if you could find numbers, you can validate an idea. And then you’re not just shooting in the dark. So for example, I think like if you’re going to start a wedding photography– or if you’re going to start a photography business, I think that a couple of key ways of going about it is you could research who else is doing what you would want to do, and then see how much social media followers they have. See what kind of support, and kind of backward engineer a plan of how you would do it, and you would be able to pretty easily quantify through using excel, and spreadsheets what you would have to do in terms of volume of, you know whether it be views and follows to you know your conversion rate, yeah. So that’s what I would do. I would actually build a spreadsheet, and try to tie that to specific metrics. That makes sense? Steve: Okay, and– yeah, yeah, it does. And now that you’ve kind of built up an artist portfolio, and you have some other prints that you’ve licensed, what is kind of the next step for you guys in terms of marketing? Arree: Oh, yeah great question, so we’ve learned two main things with our audience is that we– there are a lots of librarians that need wall decors to liven up their libraries and their reading rooms, and their spaces for story time. So we’re building out specific products for those librarians, and we’re going to be at ALA, American Library Association conference this summer, and so we’re marketing towards them very specifically. We’re also starting our social media presence online to reach lots of moms, and just going to offer very beautiful photography as well as helpful articles, and just get the conversation going. We haven’t put a lot of time into doing that yet, and but that’s all on the horizon, yeah. Steve: Nice, yeah what I like about your model is you’ve kind of started out with something that’s been working which is librarians and you’re focusing on that, and then while you’re kind of strengthening that avenue, you working on other marketing avenues and building up your portfolio of products at the same time. And I think that’s just a great strategy to pursue. You’re just taking everything in baby steps, and just seeing where it goes. Arree: Yeah, you know I read somewhere and I think it might have been even on one of your blogs that it’s good to do 50% marketing and 50% product development, because if you develop all your products without doing any marketing, then you might be at this point where you spent so much time and money developing something that you don’t know whether it works or not. And then if you market too early and you don’t have anything to talk about, then you’re really then just wasting your time. Arree: So you sort of need to build them simultaneously in baby steps as you said. Steve: So Arree where can people check out your works? I know you’ve got a nice really cool children’s book which I got autographed from you, thank you very much. Where can people find you? Where can they look at your works, and if anyone has any questions for you, where can they contact you? Arree: Yeah, so the first place to go is liveinastory.com and you’ll see lots of great wall decors and artists we are working with, and then I have a personal website for my children’s books. Its arree.com, A-R-R-E-E.com, and then if anyone wants to email me; they can email me at arreechung@gmail.com. Steve: Awesome and I know that there’s a lot of artists out there listening, and who knows, maybe they have their own art portfolio also. All right, hey well thanks a lot for coming to the show Arree, really happy to have you. Arree: All right, take care. Steve: Hope you enjoyed that episode. Arree is actually one of the few pure artists who signed up for my course to create a business based on his artwork. And I’m really ecstatic that he’s doing really well. And if you couldn’t tell from the interview, Arree exudes passion, so please go check out his work at liveinastroy.com. For more information about this episode, go to mywifequitherjob.com/episode 73, and if you enjoyed this episode, please go to iTunes, and leave me a review, because when you write me a review, it not only makes me feel proud, but it helps keep this podcast up in the ranks, so other people can use this info, find the show more easily, and get awesome business advice from my guests. It’s also the best way to support this show, and please tell your friends, because the greatest compliment that you can give me is to provide a referral to someone else, either in person, or to share it on the web. Now as an added incentive, I’m always giving away free business consults to one lucky winner every single month. For more information, go to; mywifequitherjob.com/contest. And if you’re interested in starting your own online business, be sure to sign up for my free six day mini-course where I show you how my wife and I managed to make over 100K in profit in our first year of business. Go to www.mywifequitherjob.com for more information. And once again, I just want to thank BigCommerce for sponsoring this episode. BigCommerce is one of the best shopping carts that I recommend, if you want to start your own online store without having to worry about anything technical. They’ve got an incredible theme store, where you can choose from a wide variety of attractive store designs, so you don’t need to hire a designer, and they offer integration with Alibaba, so you can easily find products to sell online. So bottom-line everything from design, to sourcing, to payment processing is all built in and you just have to populate it with your products and you can literally start your store in a matter of hours. Simply go to www.bigcommerce.com/mywifequitherjob, sign up and you will instantly receive one month free. Once again the URL is www.bigcommerce.com/mywifequitherjob. Thanks for listening. Thanks for listening to the My Wife Quit Her Job podcast, where we are giving the courage people need to start their own inline business. For more information, visit Steve’s blog at triple www.mywifequitherjob.com. How timely, we just got Aree’s Ninja book at the library! We love the illustrations and wish him much success with the website. Congratulaciones Arree for your website. Thanks for YOUR advices. Congratulations Arree and thank you to both you and Steve. Wonderfully informative.